I’ve to admit that initially this recipe forced itself upon me just because of its visual appeal. Now I would add, that it’s not only visually a winner, but overall makes a perfect appetizer: on top requiring only low maintenance and exquisitely delicious (as long as you like braised onions). They are fun to eat too, as you pick them up by their tip -especially little larger ones-, pinch them, and pop them right into your mouth. 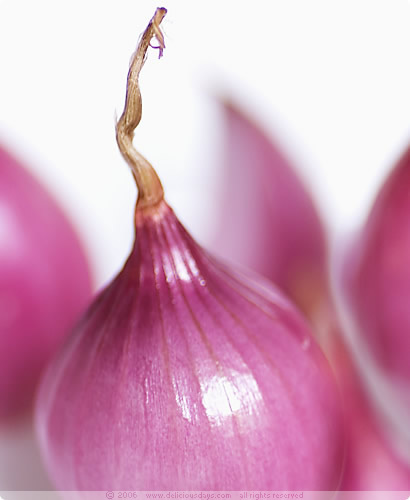 Another yummy sounding red onion recipe can be found here! Preheat oven to 180°C (360°F). Peel onions and place them in a fireproof casserole dish or alternatively on a baking tray. Sprinkle with half of the olive oil, the dried oregano and season well with salt and pepper – don’t be shy. For the first 40 minutes cover up with either a lid or some aluminium foil. For the last 5 minutes, uncover, add the olives and a few fresh oregano leaves and drizzle the rest of the olive oil over the onions. 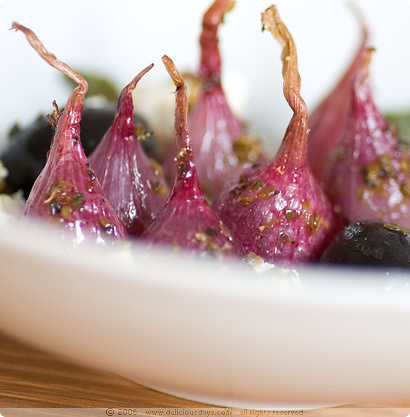 Serve with the feta cheese crumbles and a few more fresh oregano leaves for decoration. Prep time: about 10 min., braising: ~45 min. That looks amazing...where did u get those baby onions? SO funny -- just this morning, I posted Slow-Roasted Red Onions with Lavender & Thyme! They were so pretty! Yours sound much easier though sure can't remember ever seeing 'baby' red onions before. Delicious! I love red onions, although I have never tried baby ones. I use the large ones to make a delicious, vinegary relish that we enjoy with meat dishes. But now I must try your recipe. Isn't it a treat to find such beautiful looking vegetables in the winter? You honored them perfectly with such a simple yet delicious sounding preparation - and a gorgeous photo too! Pure eye candy! You guys never cease to amaze with your pictures. And I get hungry every time I visit. Now I have to look out for baby red onions, as I haven’t seen them before! Beautiful, as usual. I have a hard time finding red onions, so I bought 10 kilos last summer in Brittany (in Roskoff), where they're famous for 'pink' onions. I have just a few little ones left and will try these. Those baby onions in their pretty purple-pink skin, look more like expensive gems then vegetables! I swear you have to do a post about how to take great food photos. I, of course nominated you for best Food Photography, on the weblogs nominations list. This site is pure eye candy like the previous commentor said. The more eye catching the photos, the more I have a desire to re-create it in my kitchen. Bravo/Brava!!! Dear Nicky & Oliver - another amazing dish and gorgeous photos! I'm definitely into red onions these days (thank you for linking to my red onion tarte tatin post:), and if I could only find some mini ones now, I'd definitely give your recipe a go! These are visually pleasing! And I would love to pop them in my mouth! They look and sound so delicious. I love red onions and feta cheese! Thanks for the recipe! Bin grade zufällig auf eurer Seite gelandet, wunderschön anzusehen, Kompliment! Die Rezepte klingen auch alle sehr verlockend! Nicky, thanks for visiting my blog. I'm honored! As far as the basting with butter, sometimes I do succumb, but right now I am trying to be a good example for people who have just started dieting for the new year and are using my blog for a resource. Your blog is amazing. In fact my brother (who is in advertising and is kind of a design expert) found a reference to it on a design site and sent it to me with a note saying "have you seen this beautiful food blog." I just made this (its still hot) but with Shallots since I couldnt find baby red onions. Smells delicious and I bet it tastes delicious too because of the milder flavor. I'll report back once I get back from the party. ok so the shallot substitution tasted heavenly except that it didnt have the same visual appeal.